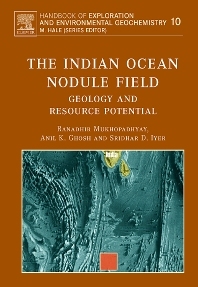 The book includes a synthesis of research findings on the structure and evolution of the Central Indian Ocean Basin and its ferromanganese deposits, in particular, on the exploration campaign since 1980s. A comprehensive mixture of recent studies along with classical theories starting from the 1960s is the hallmark of the book. Recent concepts and hypotheses, and also critical appreciation of the state-of-the-art knowledge on nodule formation and resource management are incorporated. After limiting the geographical extension of the nodule field and describing its physiographic, geological, biological, physical and chemical characteristics in chapter 1, the various structural, tectonic and volcanic elements are described in chapters 2 and 3. The bottom sediment characteristics that floor the nodules and crusts are dealt with in chapter 4. The nodules and crusts are described in detail in chapter 5, and their process of formation in the light of variable source material, local and regional tectonic activities, and midplate secondary volcanisms are discussed. The mining, environment, metallurgy, legal and economic aspects of the nodule resources are discussed in chapter 6. This title fulfils the growing need to bring voluminous, but scattered information in the form of a book for easy dissemination to students and researchers. Libraries of all universities, research institutions, government and private organisations having interest in marine mineral resources and management.